Korean BBQ is big business in Eastwood and in recent times has spread to West Ryde. Stoneage Korea BBQ seems to be very popular so I head there for a local eat. Matt totally loves Korean BBQ as he loves the sizzling flavours of the meat. It's an experience for him. Korean BBQ has been slower to grow on me but I have to say in recent years it's working. As Matt and I enter Stoneage Korean BBQ, I notice it's a relatively small restaurant with tables of 6 and those big silver air exhaust hanging above each table. I've been here three times, once ordering just off the a la cart menu and the other two times with the marinated course which is $28 per person. The marinated course is more high on value so I recommend ordering that over the a la cart menu. It's a decent amount of meat for 2 people. The marinated course portions of marinated pork rib, chicken and beef rib. This course also comes with a egg hot pot (which I had no idea what that was), rice and the usual Korean sides (radish, kim chi, potato salad, salad). The Egg Hot Pot is essentially an intact scramble egg dome. It's fluffy with chives and is nice to eat with the rice. The customer service at Stoneage Korean BBQ is impeccable as they assist with the cooking of the meat and also change the wire between each meat. They are also very attentive and will refill any sides if you finish them. The staff are very attentive but not talkative. The meat is sizzling and the smell of cooking meat instantly provokes more hunger pangs. I see Matt's eyes light up. I gobble up the cabbage based salad with the light dressing and kim chi. Then we get into the meat. The quality of the meat is high and it's very tasty. Matt goes for a medium rare and I on this occasion go for well done meat. 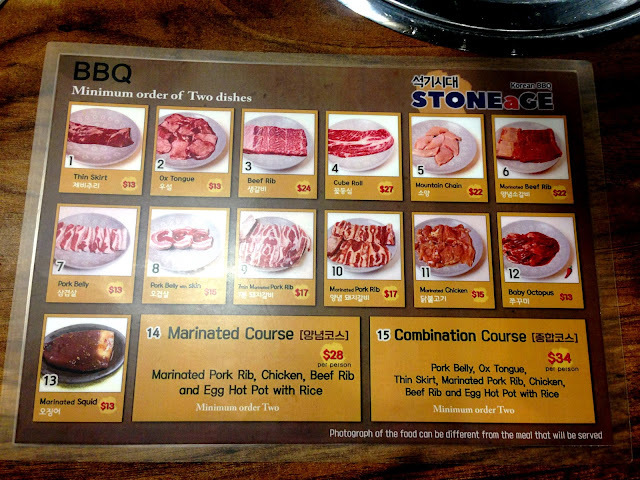 Summary: Overall, I highly recommend Stoneage Korean BBQ. The food is of high quality, the changing of wires is very hygienic and the customer service is great. I like the sides and it's a clean restaurant. Love it!! Weekend Food Escapes dined anonymously and independently paid for this meal. All words, photos and opinions are my own.